Congratulations to Samantha Brinkman-Berkhofer on her purchase of Armani! Armani is a 13 year old Dutch gelding. At 17.1 hands, he is doing Third level work and does not spook. 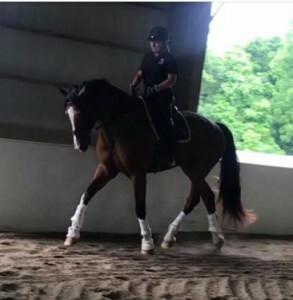 Armani is a total gentlemen and perfect for a rider needing a larger horse with a good temperament. Armani is appropriate for AA and Jr/Yr. He is very handsome and enjoys work. Armani is completely sound and not currently on any maintenance.